We've been helping voiceover artists get work and market themselves for over 20 years (since 1998). 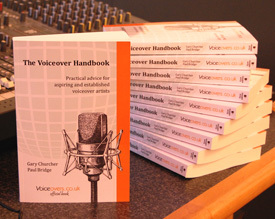 If you're interested in finding out about the voiceover industry, or you are active in the industry but looking for some guidance, then please consider purchasing our paperback book "The Voiceover Handbook". What studio equipment will I need? How do I cost up corporate jobs? What should I put on my demo? How do I mark up a script? How can I improve my sight reading? Can I learn character voices? Special Offer! Save around 50% off the normal price if you buy online on or before 22 April 2019 (while stocks last). Click here. We have a free factsheet which introduces you to the voiceover industry; please email us if you'd like a copy and we'll send one over in Adobe Acrobat (PDF) format. Please allow a few days for us to process this email. Your email address will be stored by us so we can send you any future updates to this guide or information specific to aspiring voiceover artists.